Lionsgate has released the first trailer for their upcoming thriller Spinning Man, along with the first poster. 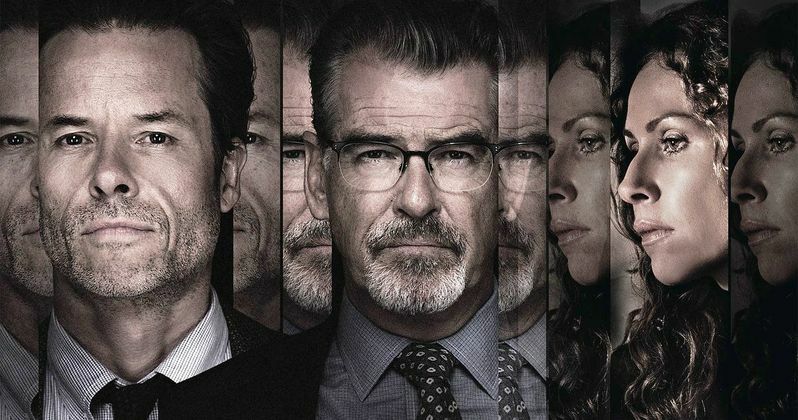 Guy Pearce stars alongside Pierce Brosnan and Minnie Driver in this taut and twisty thriller, which serves as a gripping examination of crime, punishment, and conscience. While Guy Pearce's character may seem on the outside to be a harmless family man, he may be hiding a deadly secret. Evan Birch (Guy Pearce) is a family man and esteemed professor at a distinguished college, where his charm and reputation have made his philosophy class very popular. When a female student named Hannah goes missing, Evan's previous off-campus dalliances make his wife (Minnie Driver) question his alibi. Gruff police Detective Malloy (Pierce Brosnan) has even more reason to be suspicious when crucial evidence makes Evan the prime suspect in Hannah's disappearance. Suddenly, the questions Evan faces aren't merely academic, they're a matter of life or death. Director Simon Kaijser's taut and twisty Spinning Man also stars Jamie Kennedy (The Scream series, Ghost Whisperer) and Clark Gregg (The Avengers, Agents of S.H.I.E.LD.). It also features newcomers Odeya Rush (Lady Bird), Alexandra Shipp (X-Men: Apocalypse, Straight Outta Compton), and Freya Tingley (Once Upon a Time). Simon Kaijser directs from a script by Matt Aldrich, based on George Harrar's book of the same name, with Keith Arnold and Ellen Wander producing. While April isn't always the busiest month at the box office, there will be plenty of competition for the R-rated thriller. While Spinning Man isn't expected to get a nationwide theatrical release, it will arrive in theaters and on VOD formats April 6, the same date that Paramount's thriller A Quiet Place, Universal's R-rated comedy Blockers and Entertainment Studios' thriller Chappaquiddick. Also opening in limited release that weekend is Cohen Media Group's upcoming documentary Spiral and Great Point's drama Where's Kyra?. It will also arrive just over a week before the highly-anticipated adaptation of Ernest Cline's novel Ready Player One, which hits theaters on March 28. Simon Kaijser is a Swedish director who makes his English-language directorial debut with this thriller, after making Swedish films such as Stockholm East and directing a number of mini-series such as Before We Die and Life in Squares. Matt Aldrich made his screenwriting debut with the 2007 film Cleaner, starring Samuel L. Jackson, and he also co-wrote the Disney Pixar hit Coco with co-director Adrian Molina, which set a new Mexican box office record. Take a look at the new trailer and poster below, courtesy of Lionsgate YouTube.